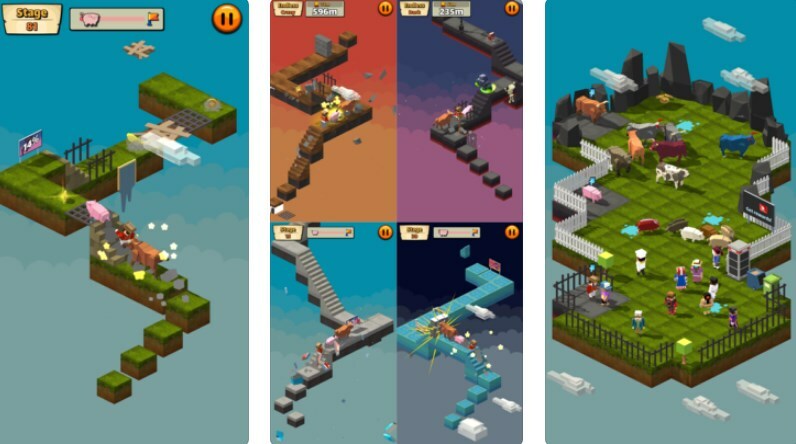 One of the most popular games for our smartphones nowadays is certainly the endless running games. These games offer us to have fun going on our own adventure and to complete missions while challenging our skills and keeping us addicted to playing. But, choosing the best endless running game can be confusing. So, we did our research and we have for you one very exciting and entertaining game that offers you all of this. Let’s discuss it. Developed for IOS and android users, this arcade adventure game with endless running gameplay is very addictive and exciting, requiring the focus and fast skills of players to bring order between the running cows, pigs and humans. Suitable for all ages, very entertaining, the game is easy to play only with tapping on screen to change the order between the running animals and humans. Challenging the player to react fast, the game offers players HD graphics set in the incredible environment with missions to complete and cool adventures for every arcade lover. What are the best features of the game? When it comes to the features offered by the game, players will certainly enjoy the excitement and the challenges for fulfilling while having fun and getting coins and jewels for their fast reacting and focus. The order among the cows, pigs and humans running need to be set! By tapping on the screen and reacting fast, players will change the order, bringing pigs to eat the food, cows to break the walls and humans to acquire the goods. Along the mission and adventure, players need to collect the jewels and coins and use them to buy new cows, pigs and humans that have special talents that can be of use for the mission. Choosing between 11 humans, 7 pigs and 8 cows that all have different talents, players will be able to easily complete the mission. With 2 different game modes, players can choose to play the endless running gameplay with normal, crazy and dark mode or the campaign mode with over 100 stages. Whatever the player chooses, he will certainly have fun on his adventure while completing the challenging missions to set order between the running humans and animals. Download the game on App Store and Google Play for free to help animals and humans!